Located in the Rincon-de-Loix area of Benidorm, these apartments are just 5-minutes walk from the magnificent white sands of Levante beach. Each of the apartments in Mayra boasts an individual balcony, where you can enjoy sunbathing in private. Prepare your own meals in the kitchen of these apartments, and enjoy eating lunch with all the family. 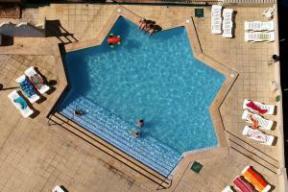 Relax by the complexs outdoor swimming pool, and take a dip to cool off in the warm sunshine.